Astronomy professor Sara Ellison, who plays violin in her free time, says studying the night sky is like learning to appreciate the intricacies of music. Leading astrophysicist Sara Ellison unravels how galaxies, such as the Milky Way, form and evolve. When Sara Ellison looks up at the stars, she does so with the hallmark precision of a scientist. “After so many years of studying astronomy, it’s hard for me to channel the humanist wonder that most people have when they look into the night sky,” says the University of Victoria astrophysicist. But her wonder been replaced with something more profound. As a professor in the Department of Physics and Astronomy, Ellison is part of UVic’s distinguished astronomy, astrophysics and cosmology group, one of the best such programs in Canada. 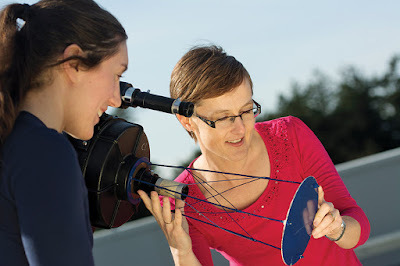 Her work focuses on galaxies—gravitationally bound systems, such as the Milky Way, that contain millions to trillions of stars, along with gas, dust and dark matter—and tries to unravel how these endlessly complex systems form and evolve.